I think it might be time for something sweet! 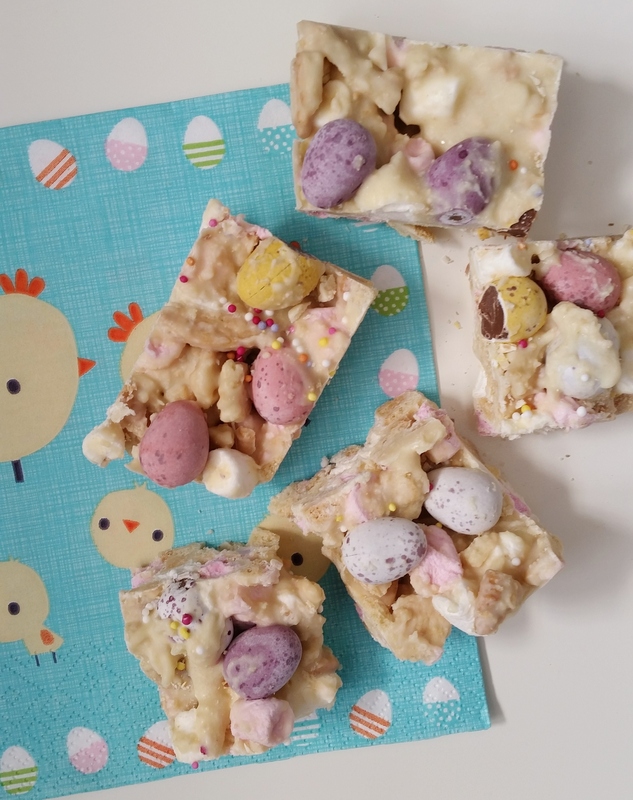 It’s been so long since I last shared a recipe and as Easter is approaching it seems like the perfect time. I warn you though this is not suitable for any diabetics out there, it is very sweet! You may remember I had to go on a dairy free diet whilst I was breastfeeding Mabel. That included over Christmas. Now Mabel is fully weaned I am taking full advantage of being able to enjoy food again, my waistline is not thanking me for it. 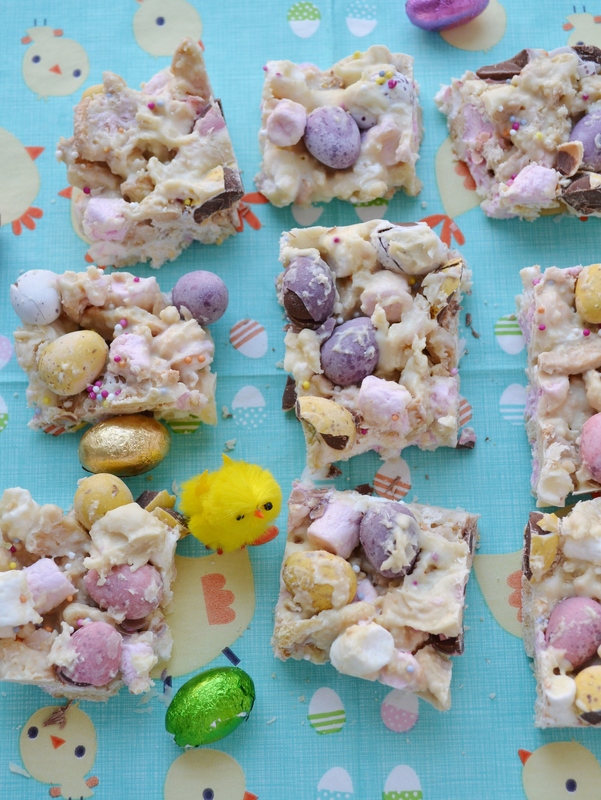 One of my favourite Easter treats is Mini Eggs, I cannot get enough of them! 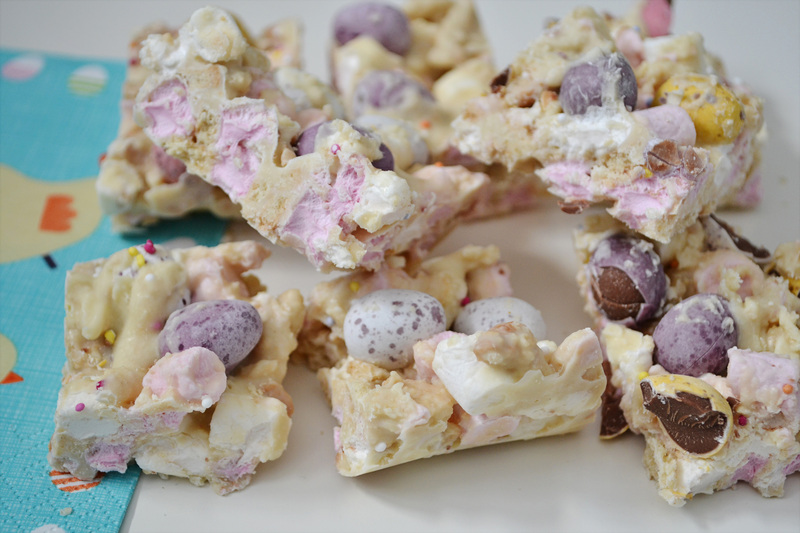 I was out for lunch with my mum a couple of weeks ago, I had the biggest bit of Rocky Road, it was delicious and inspired me to create a version of Rocky Road especially for Easter. So instead of milk chocolate I used white and instead of digestives I’ve used Golden Oreos, which I think make them a lot more exciting than your standard rocky road! I also decided to withhold the dried fruit and in their place are mini eggs! (I did warn you this is not for the diabetic!). To complete it a slight sprinkling of 100’s and 1000’s although I do wish I added a few more now. I do love being a mum but sometimes it means I don’t have time for baking, or… well anything that takes me away from her, and making this was one of those occasions! Mabel although only 18 months has well and truly reached the ‘terrible 2’s’ and right in the middle of melting the chocolate she decided to throw the mother of all tantrums, she’s become a real clingy mummy’s girl recently and I have had to learn to either leave what I’m doing till another time or do them one handed! Which in this case I did. Luckily this is a super easy recipe. This is definitely one to do with the kids over the holidays. Whilst the chocolate is melting, place the biscuits in a large zip lock bag and crush with a rolling pin. Don’t worry if there are some bigger bits, because of the cream it is not easy to get an even crush but I think that adds to the charm. Once the chocolate has fully melted add half the marshmallows and stir, as the chocolate will still be hot they will start to melt. Set aside for a couple of minutes until the chocolate is cooler. Add the rest of the marshmallows and the broken biscuits. Stir until everything is evenly combined. Once mixed place into the lined baking tin and press down. Add the mini eggs by pushing them into the mix randomly, I added about a bag and a half but you can add as little or as many as you like! Sprinkle with 100’s and 1000’s. Place in the fridge, preferably overnight. Once fully set cut into squares and serve. Keep refrigerated.